Three pole positions from three events in the 2019 season: Works drivers Nick Tandy (Great Britain) and Patrick Pilet (France) have planted their No. 911 Porsche 911 RSR on the first grid spot for round three of the IMSA WeatherTech SportsCar Championship at Long Beach (USA). Laurens Vanthoor (Belgium) and Earl Bamber (New Zealand) complete the first grid row in their ca. 510 hp racer with the starting number 912. So far this season, the Porsche GT Team remains unbeaten in the hunt for top qualifying times. During the 15-minute qualifying session, Nick Tandy advanced closer and closer to the track barriers at the street circuit in California, with the Briton improving on his best time with each lap. In 1:16.313 minutes, Tandy not only set a new qualifying record at Long Beach, but also added to his personal record in the IMSA series. This marks the seventh time that the Porsche works driver from Bedford (Great Britain) has posted the fastest time in the GTLM-class qualifying. Laurens Vanthoor employed the same strategy as his British teammate. At the end of the qualifying session, the Belgian was just 0.064 seconds adrift of Tandy’s fastest time. 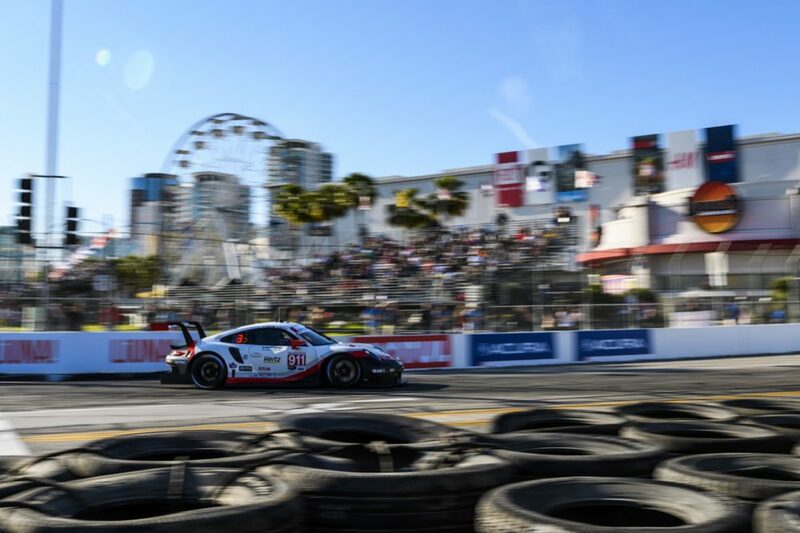 Porsche takes off into the 100-minute race at Long Beach with two cars on the front row for the second consecutive time after an ideal qualifying at the twelve-hour in Sebring (USA).